SIPTU representatives have today (Friday, 14th September) confirmed that thousands of Section 39 health and social care workers will participate in a one day national strike next Tuesday (18th September) to highlight their claim for full pay restoration. A demonstration to be addressed by ICTU General Secretary, Patricia King, outside the Department of Health in Dublin will take place from noon on the same day. SIPTU Health Division Organiser, Paul Bell, said: “Our members deferred strike action last February at the request of the Minister for Health, Simon Harris, to allow for a Workplace Relations Commission (WRC) process to be initiated. He added: “What is most staggering about this dispute is that An Taoiseach, Leo Varadkar, confirmed on the floor of Dáil Eireann that these workers, many of them low paid, have an established pay link with the public service and as such are entitled to pay restoration in line with directly employed counterparts, under the FEMPI legislation. It should be remembered that Dáil Eireann voted unanimously in favour of a Fianna Fail private members’ motion seeking pay restoration for these workers. It is incomprehensible to our members that the Government and HSE acknowledge that the monies are owed, yet will not pay them. “The WRC process did produce a formula of how Section 39 organisations could make applications for the funding necessary to pay our members. SIPTU, ICTU and other unions have agreed that this proposed formula is acceptable. Last October, SIPTU members commenced a campaign for pay restoration in Section 39 organisations. This involved tremendous efforts by local shop stewards and activists in galvanising members in pursuing a campaign for industrial action where required. This campaign including lobbying of local political activists, TDs, Senators which resulted in both the matters being subject to Dail debates and a Joint Oireachtas Committee on Health hearing at which we presented the arguments for pay restoration. Following a successful campaign, our members voted overwhelmingly in favour of industrial action. The real threat of withdrawal of labour was presented to the Government last February. All along, the Government maintained the position that they were not part of this process and should not be part of the solution. It was only through our collective efforts that Government were forced to the negotiating table. A conciliation process was agreed by the Workplace Relations Commission and in order to avert the impending strike action. This intervention forced the Government departments and Section 39 employers to engage in the process. The Workplace Relations Commission recommended that the Government departments conduct an audit review on fifty Section 39 employment identified by the unions. The purpose of the audit was to ascertain the level of funding cuts, the pay cuts and what pay restoration had taken place if any. It also forced the Section 39 agencies to engage directly on the funding requirements for the services provided. We understand that the process to complete this audit and the delays in having re-engagements in the Workplace Relations Commission is frustrating. During this period, we continued to agitate to ensure the dispute remained relevant. The Workplace Relations Commission reconvened all the parties on the 9thJuly 2018 to discuss the audit report and its recommendations. Acceptance that Government will have to assist in finding and funding a solution. That Section 39 Agencies will have to present a cost analysis of the increased funding required. The Chairman of the Board will have to sign off on same and will be accountable in the event an audit determines the figures as inaccurate. Verification of the Unions claim for pay restoration and confirming our members had suffered pay cuts through reductions in funding. A process for pay restoration should be implemented where cuts took place. SIPTU representatives maintain that as the pay restoration commenced in 2017 that this should be reflected in the agreement reached for section 39 members. At this hearing, SIPTU representatives left the employers’ side in no doubt of their anger and frustration at the delays in furthering this process. We also insisted that commencement of pay restoration measures have to happen in 2018. Failure of the Government side to confirm pay restoration in 2018 will lead us with no option but to commence a course of industrial strike action from September. The Workplace Relations Commission adjourned the hearing to Wednesday 25th July at which time the Government side will have to respond to our demands. If we do not get a satisfactory response we will be preparing our members to engage in a course of industrial action from September. We have tried to resolve this matter without the requirement of industrial action, however, we will not be found wanting in ensuring our members’ claims are progressed. The process to date has been slow and arduous. We acknowledge the frustrations and patience demonstrated by members. We have placed the Government on notice of our intention to invoke again our threat of industrial strike action if we do not see real progress and a genuine commitment to finding a resolution to this matter. Our members have shown great determination in pursuing this claim. We will not be found wanting in securing a fair and just process of resolving this dispute. Young people who face the scourges of low pay and insecure work need to engage with trade unions. A great place for unions to start is with the 180,000 students studying on third level campuses across the country. Every year, SIPTU representatives visit third level colleges in conjunction with the Union of Students in Ireland and embark on targeted site visits to student nursing, healthcare and paramedic courses. SIPTU organisers and activists run campaign stands, sign young people up to the union and gather signatures for petitions demanding the living wage and secure jobs for all workers. This year, activists handed out a new Young Worker Survival Guides full of information on workers’ rights and trade unions. In the last few years, an important partnership has been agreed between SIPTU and the Union of Students in Ireland. Under the agreement, all members of USI can access advice and representation from SIPTU through the Workers’ Rights Centre. Many young people today face insecurity and hardship in terms of their employment and living standards. In addition to the rising cost of education and housing, young workers often experience precarious working arrangements. Issues such as low pay, short-term contracts, insecure hours – these were some of the injustices that gave rise to the trade union movement many years ago. Young people today need trade union representation, and trade unions need young people to become members. Yet while thousands of young people have joined SIPTU in recent years, there is still a very large percentage who are not joining unions. While there are many possible reasons for this, one issue is probably that many young people have never come into contact with a trade union before. Without having a visible union in their workplace, or having a family tradition of union activism many young people think of trade unions as representing “other” groups of workers. This is reinforced through the media where most coverage of trade union activity focuses on transport disputes, public sector negotiations etc. – crucial matters but ones which might not seem immediately relevant to many workers in non-unionised parts of the private sector. Many employment sectors are hostile ground for union organisers and so young workers in these sectors may have never considered joining a union. They might not realise that we represent people in their profession or what the benefits are. It is crucial that the union movement explores new ways of reaching young people, and SIPTU’s current development plan layout many proposals in this regard. Increased visibility, campaigning and organising on college campuses can be a crucial part of this. During the college visits, we found great support among the students’ union activists for working with SIPTU. The USI has adopted strong policies on issues such as the living wage and precarious work. All workers have the right to fair pay and secure jobs. The growth of precarious work must be challenged. Fairness at work and justice in society are ideas that appeal to all generations. Through organising into trade unions young workers have a powerful tool for securing these rights, and as Ireland’s largest union, SIPTU can lead the way. SIPTU representatives have said that any attempt by the Government to recalibrate the Public Service Stability Agreement (PSSA) will be resisted wholehearted by the membership. SIPTU Health Division representatives today (Tuesday 1st, May) met with management of the Health Service Executive and National Ambulance Service to progress SIPTU members’ claim to review the “Roles and Responsibilities” of Ambulance Professionals. SIPTU representatives raised the issue of retirement age and officer/non-officer status with management. We can confirm that clarity will be provided on the status of officers and non-officers which is of particular interest to our members. We will circulate this information in due course. The parties have also agreed to reconvene for a specific discussion on the retirement age of ambulance professionals. As our members are aware, this issue is complex and will require external international expertise, which SIPTU will provide. The next meeting is set for the end of May. Further updates will be issued in due course. Bell added: “The restoration of public confidence in our national cervical cancer screening programme is vital but there are also lessons to be learned across the public service. Right now, our members in the Mater Misericordiae University Hospital are preparing for strike action in protest at management proposals to outsource the Central Sterile Services Department (CSSD). The arrangement imposed on new entrants since 2011 has resulted in nearly 60,000 public service employees, working in the health, education, local authorities and other sectors, doing the same job for less pay than their colleagues. SIPTU Health Division Organiser, Paul Bell, said: “Our members don’t expect a big bang solution to this issue. However, they do expect the presentation of concrete proposals that outline a clear road map towards the ending this pay injustice. He added: “SIPTU members have consistently argued that it was unfair of the Government to cut the entry grade of pay for workers joining the public service since 2011. We now have an opportunity to resolve this injustice through dialogue within the terms of the PSSA. ﻿</iframThis did not happen in Ireland or anywhere else in Connolly’s lifetime. More than 200,000 Irishmen served in British forces during the war. In part as a protest, Connolly threw in his lot with the Republican insurgents of 1916 and was executed as a result.But just two years later, Irish workers did with a general strike halt an attempt by the British government to extend conscription to Ireland in its tracks. The general strike of 1918 became possible due to the rapid wartime growth of the ITGWU, from just 5,000 members after the Lockout of 1913 to more than 60,000 by 1918 as workers, both urban and rural, tried to bring wages up to the level of rising wartime food prices and inflation. What was more, by this time Ireland was also in political turmoil. British rule had been fatally compromised by the repression unleashed by the rebellion, but even more so by the threat to impose conscription on to Ireland in the spring of 1918 following the German offensive of that year. By 1918, there was little appetite for more war in Ireland and virtually none for conscription. All the nationalist parties campaigned against it, including Sinn Fein and the Irish Parliamentary Party, which withdrew from Westminster in protest. The Irish Volunteers hugely increased in numbers but largely disarmed since the Rising, prepared to resist it. But it was the action of the trade unions which did most to defeat conscription. The Irish Trade Union Congress called a one-day general strike against the imposition of conscription and brought the country to a standstill on 23rd April 1918 – the largest strike to date in Irish history. Everywhere outside of unionist dominated Belfast, the country lurched to a halt; transport, even the munitions factories set up for the war ceased work for the day. Cumann na mBan, the Republican women’s movement also called a day of protest, lá na mban (‘the Striking against war in the trenches day of women’) in which they urged women not to take the jobs of men conscripted for the army. Not long afterwards the British government let the Conscription Act lapse. The general strike had demonstrated that more troops would be needed to implement conscription in Ireland than would be gained from the draft. This did not happen in Ireland or anywhere else in Connolly’s lifetime. More than 200,000 Irishmen served in British forces during the war. 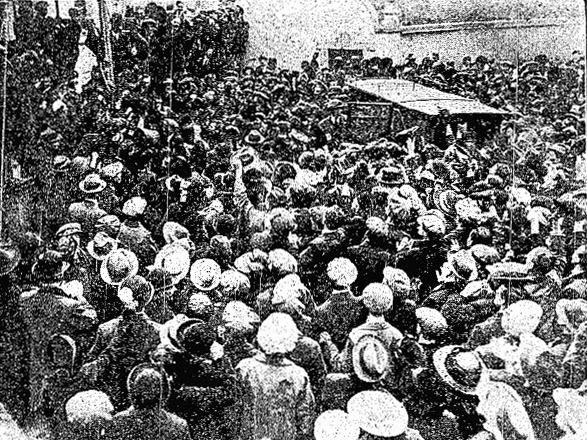 In part as a protest, Connolly threw in his lot with the Republican insurgents of 1916 and was executed as a result. But just two years later, Irish workers did with a general strike halt an attempt by the British government to extend conscription to Ireland in its tracks. What was more, by this time Ireland was also in political turmoil. British rule had been fatally compromised by the repression unleashed by the rebellion, but even more so by the threat to impose conscription on to Ireland in the spring of 1918 following the German offensive of that year. By 1918, there was little appetite for more war in Ireland and virtually none for conscription. All the nationalist parties campaigned against it, including Sinn Fein and the Irish Parliamentary Party, which withdrew from Westminster in protest. The Irish Volunteers, hugely increased in numbers but largely disarmed since the Rising, prepared to resist it.